A pair of Ring-necked Ducks rest at a pond in Darien, March 2014. Here is the latest For the Birds column. The action was fairly slow but not terribly so. I didn’t find any out-of-the-ordinary species, but I did get a lot of the common ones. I got my chickadees, titmice, white-breasted nuthatches, downy woodpeckers, red-bellied woodpeckers and American goldfinches. A small flock of pine siskins came to the backyard just as I was wrapping things up. I was glad it arrived for the count as this bird has been a regular visitor all winter. The highlight of the count for me was checking out the beaver pond at the end of the trail that begins behind my house. The pond was mostly frozen, probably about 85 percent so, but the open water that did exist on the far edge held a lone male hooded merganser and nine ring-necked ducks. Did I say nine? I meant to say 12. No, make that 13. When getting a precise number of birds is important, such as when doing a bird census like the Great Backyard Bird Count, it is important to check and double check the diving ducks. When I first looked at the ring-necked ducks, I counted nine. I moved along the edge of the pond to change my angle and suddenly I counted 12. I watched for another minute and another duck popped up its head to make 13. I watched carefully for another couple minutes and the number stayed at 13. Ring-necked ducks are one of the more common diving ducks we see in New England during the winter. Diving ducks are the ones that, true to the description, dive underwater for their prey such as fish and crustaceans. The other types of ducks are dabblers and they simply tip up and stick their heads in the water in their search for food. Most of our very common ducks are dabblers. Mallards, black ducks, wood ducks and teal are all dabblers. 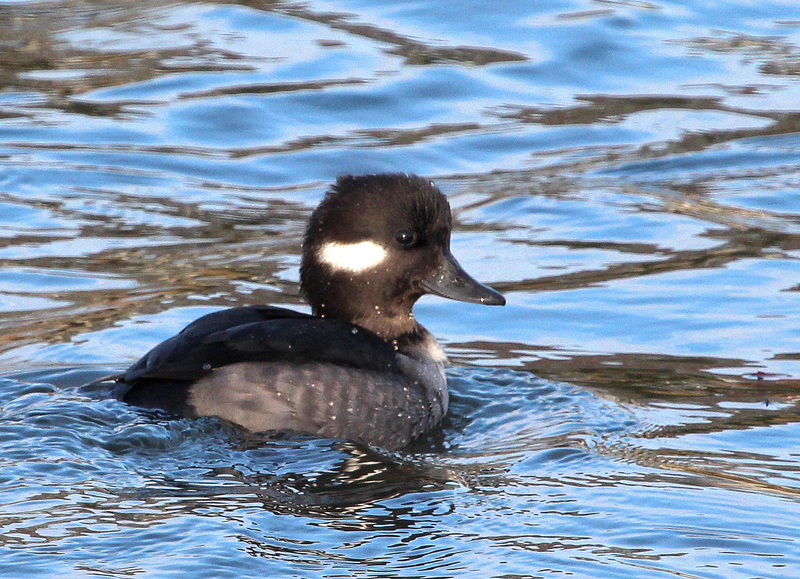 The divers include species such as the mergansers, bufflehead, goldeneye, and, as mentioned, ring-necked ducks. Dabblers are sometimes difficult to count because there can be so many of them they tend to crowd each other out. But at least you can always see them. They don’t “disappear” underwater. When you approach a pond and see a flock of divers, you never know whether you are looking at all of them or not. Not that it would have made a whole lot of difference in the grand scheme of things if I had submitted 12 ring-necked ducks, or even my original count of nine, for that matter. But, of course, I was trying to be as accurate as possible so I’m glad I was able to submit the correct number. All in all, it was a fun count with a decent number of species. How did you do? Feel free to send me an email and let me know. For more information and international results of the Great Backyard Bird Count, click here. Photo by Chris Bosak A white-breasted nuthatch sits on a bird-shaped birdfeeder during the winter of 2016-17 in Danbury, Conn.
As promised, here are the results of my Great Backyard Bird Count experience this morning. It wasn’t overly successful in terms of finding birds, but it wasn’t too bad either. At any rate, all checklists are valuable, so my 2019 GBBC list is in. Not that participants are limited to one checklist, and I may just do another one tomorrow as the Count runs through Monday. My species list included: black-capped chickadee, tufted titmouse, white-breasted nuthatch, downy woodpecker, red-bellied woodpecker, dark-eyed junco, pine siskin, American goldfinch, hooded merganser, and ring-necked duck. The waterfowl, of course, I spotted at the pond at the end of the trail behind my house. The pond is 85 percent frozen, but open just enough to hold a small flock of ring-necks. Feel free to share your highlights by commenting on this site or BirdsofNewEngland.com Facebook. A Red-breasted Nuthatch perches near a bird feeding station in Danbury, Conn., Oct. 2016. There is still time to participate in the Great Backyard Bird Count. In fact, in recent years the Count has been extended through Monday — so no excuses. It’s a beautiful day in New England (at least where I am) and I’m eager to head out right after making this post. I’ll let you know what I find later today or tomorrow. As always, feel free to send me your highlights. Remember, if you see a ton of birds or only a few (or none), it’s all good data. Don’t fail to submit results just because you think it was an “unsuccessful” bird walk. Click here for my recent column on that matter. Many people are concerned that they are not seeing chickadees at their feeder this winter. This is your chance to contribute to data that may help scientists determine if, indeed, there is a problem. All the information about the GBBC and how to submit your results may be found by clicking here. I am guilty. I admit it. Even though it would valuable to report all of my walks to this online bird database, I often submit only results for the walks that yield unique or plentiful species. I saw only two chickadees and a turkey vulture flyover, I say to myself. How is that data going to be valuable? In reality, that data is just as valuable as the results I turn in when the birding is good. Scientists who track this data need to know what’s going on out there at all times, not just when a lot of birds are around. 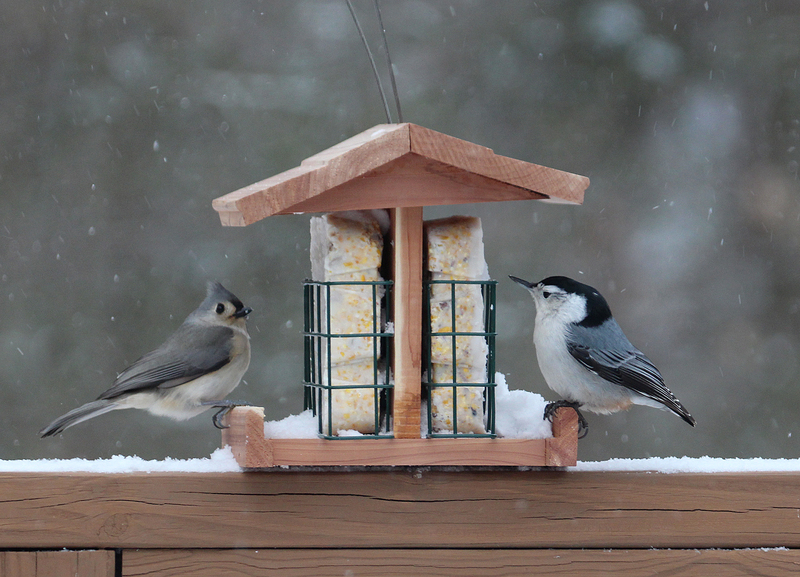 A Tufted Titmouse and White-breasted Nuthatch share a feeder during a snowstorm in Danbury, Conn., Jan. 23, 2016. I do not shy away from taking walks to look for birds when the snow is actively falling, in fact I thoroughly enjoy walks at such times. But I also enjoy very much watching the activity at the feeders during snow falls. Here’s a press release from the Great Backyard Bird Count folks: All text and photos below the dotted line are directly from the release. I love the charts they compile following this count. Great photos included, too. Here’s my post directly following the GBBC. New York, NY, Ithaca, NY, and Port Rowan, ON–Participants from more than 100 countries submitted a record 147, 265 bird checklists for the annual Great Backyard Bird Count and broke the previous count record for the number of species identified. The 5,090 species reported represents nearly half the possible bird species in the world. The four-day count was held February 13-16, the 18th year for the event which is a joint project of the Cornell Lab of Ornithology and the National Audubon Society with partner Bird Studies Canada. A female Bufflehead swims in Darien. I hit Weed Beach this morning for the Great Backyard Bird Count. The woods were fairly quiet, but the water offered some good birds. Some of the highlights were about a dozen Black-capped Chickadees, some American Robins, a Northern Mockingbirds, several Red-breasted Mergansers, a few Gadwall, dozens of American Black Ducks, dozens of Bufflehead and a couple Common Goldeneye. So what was on your list? Feel free to comment below.